Love Food Hate Waste, now I'm a big believer in this campaign, which originated in the United Kingdom in year 2007 with the aim of reducing the amount of food waste. Even our government has been promoting it, to help save money and stopping tonnes of food waste being thrown away. Wasting food means that all the resources used to produce that food is also wasted. The good folks from Grand Bluewave Hotel Shah Alam came up with this rather interesting Agehan Set Menu recently, so do check it out below. At Agehan Japanese Restaurant, led by the Executive Sous Chef, Chef Firdaus Ismail, we were introduced to the Agehan Set Menu. 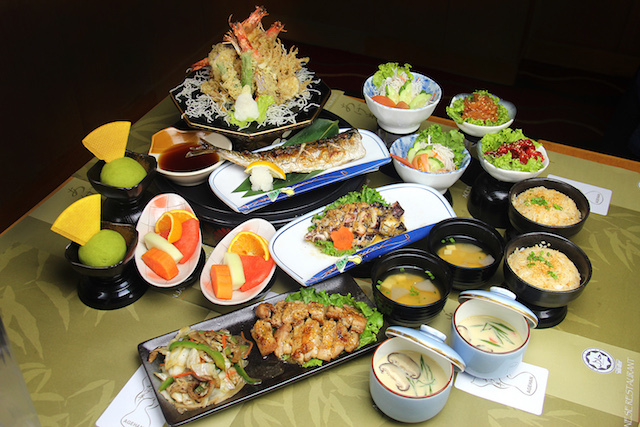 The Agehan Set Menu is suitable for minimum of 2 persons per order and served in three different sets, every each set consists of food starter, soup, main course, appetizer, dessert and beverage. Best part is, it's halal certified! The first set is called as Sashimi Gozen, priced at RM68.00+ per person, shown in first picture above. This set is a beautiful set up with food starter of Chuka Kuraage (Jellyfish), Chuka Idako (Baby Octopus), Yasai Salada (Japanese Salad with Dressing), Chawan Mushi (Japanese Egg Custard) and Miso Shiro (Miso Soup). The set does not end here as there will be main course of Teppanyaki such as Ika (Squid), Ebi (Prawn), Tori (Chicken) and two choices of rice, Yakemeshi (Fried Rice) or Gohan (Japanese Shortgrain Rice). Not to forget the appetizer for this set is Assorted Sashimi such as Tako (Octopus), Abura Bozu (White Tuna), Maguro (Tuna), Shake (Salmon) and California Temaki (California Hand Roll). 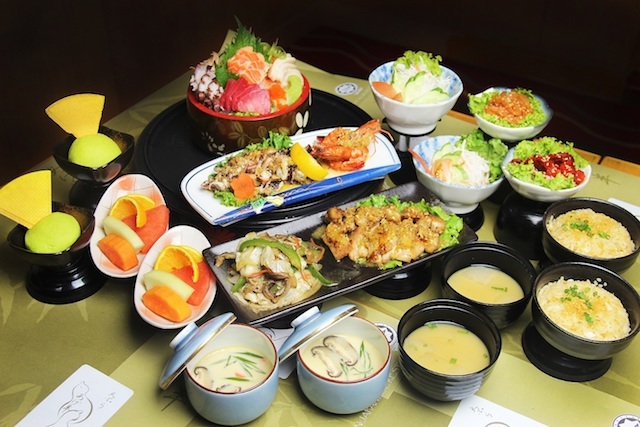 The second set is Sushi Gozen, priced at RM58.00+ per person with the food starter of Chuka Kuraage (Jellyfish), Chuka Idako (Baby Octopus), Yasai Salada (Japanese Salad with Dressing), Chawan Mushi (Japanese Egg Custard) and Miso Shiro (Miso Soup). Further serving with varieties, the main course is Teppanyaki consists of Ika (Squid), Ebi (Prawn), Tori (Chicken) and two choices of rice, Yakemeshi (Fried Rice) or Gohan (Japanese Shortgrain Rice). As for the difference with the previous set, the appetizer consists of Assorted Sushi such as Tako Sushi (Octopus Suhsi), Maguro Sushi (Tuna Sushi) and Shake (Salmon Sushi), while for the Assorted Makimono consists of Kappa Maki (Cucumber Maki) and Kani Maki (Crabstick Sushi). Lastly, the third set is namely as Tempura Gozen, priced at RM48.00+ per person. 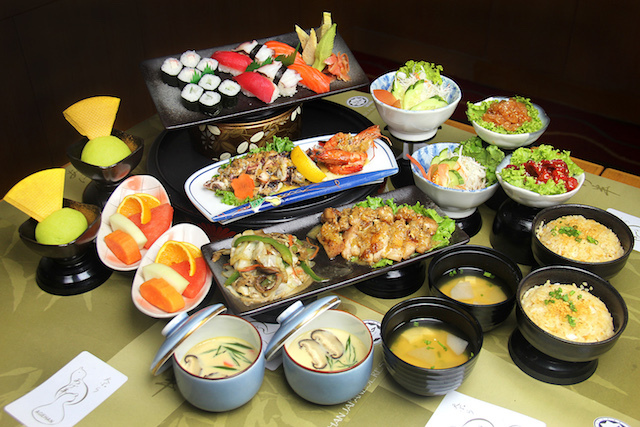 The food starter for this set is similar with previous two sets while the main course is Teppanyaki consists of Ika (Squid), Tori (Chicken), Yasai (Vegetable), Saba Shioyaki (Grilled Mackerel Fish with Salt) and two choices of rice Yakemeshi (Fried Rice) or Gohan (Japanese Shortgrain Rice). This set is generously end with the appetizer of Tempura Moriawase such as Ebi (Prawn), Kizu (Fish), Carrot, Brinjal and Shitake. All of these set ends with Japanese refreshing desserts and beverage of Mixed Fruit, Green Tea Ice cream and Hot or Cold Japanese Green Tea.